This is a continuous process. Recently, we had five volunteers and two employees working on three projects in the Collection. The project most heavily documented in these photos is rehousing our garment collection in Tyvek slipcovers so that the garments are protected from accidental snagging of buttons and cabinet hardware, moisture and dust, as well as having their own transportation receptacle when transporting them to the museum for an exhibit. The covers also create an enclosure to capture any pieces that may fall from the garment, such as buttons or beads, while allowing us to monitor for pests (i.e. casings, droppings that would collect in the bottom of the cover). Not that it happens often, as our facility is mostly pest-free, but we still have to monitor for them! 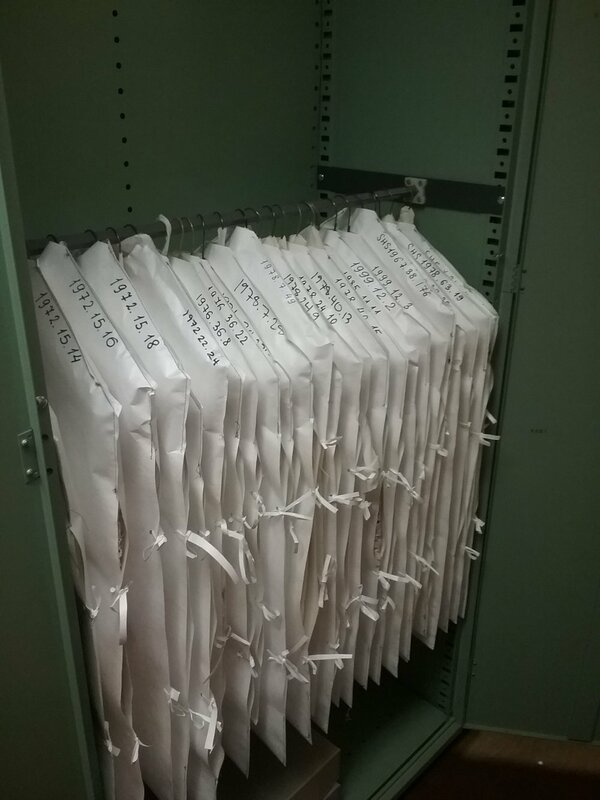 Also, putting the accession numbers on the Tyvek garment covers, and then putting them in numerical order allows us to more easily find what we need without over-handling the rest of the objects. This is preventative conservation we learned from Elise Rousseau, a Bay Area conservator who surveyed our collection and directed a Costume Society of America Angels Project workday to kick off our overall rehousing project! Don’t they look wonderful lined up like that?? It’s all about keeping our objects safe and accessible!